If you are building a new home or simply renovating your current home, a luxury that you can enjoy daily is a semi frameless shower from Carolina Glass & Mirror. When you work with our Raleigh, NC glass company, you can expect your shower glass to be professionally fabricated and installed, bringing a touch of elegance into your home bathroom. Semi frameless showers are an excellent choice if you would like an upgrade from a traditional, fully framed shower. 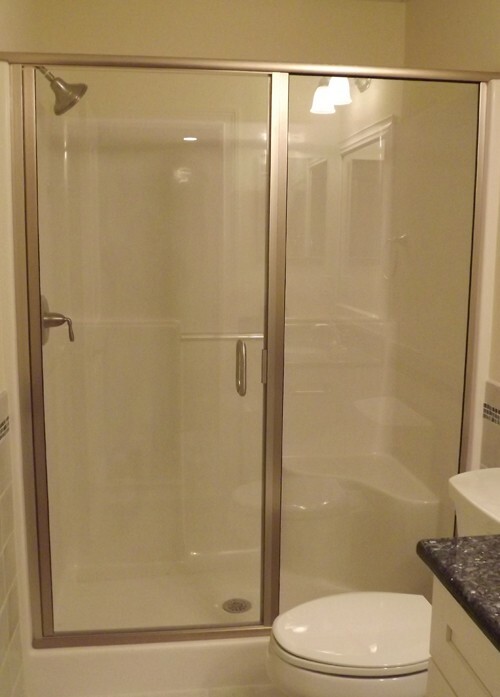 Our shower door designers and installers can easily create a custom shower door in Raleigh, as well as make your semi frameless shower door as seamless as your space will allow. In addition, our residential class company offers many options for shower door hardware, enabling you to find the perfect fit for your style. True to all of Carolina Glass & Mirror’s products, our Raleigh semi frameless showers are made with only the best materials. We use Cardinal Shower Enclosures, which offers high-quality aluminum and glass, and swing and sliding door units are available in many finishes, configurations and sizes. Have Carolina Glass & Mirror take care of your Raleigh semi frameless shower door installation, and ask us about all of our shower door options. If you would like to see our complete selection of residential glass products, visit our showroom in Garner, NC. Feel free to contact us at 919.662.9050 if you would like to learn more about what elements of luxury our glass company can add to your home. Since 1994, Carolina Glass & Mirror has served Raleigh, NC and the Triangle area with semi frameless shower doors and other glass products.